There's slack and email, and then there's WhatsApp. Our San Francisco and Tel Aviv office has creative ways of staying connected. For business, we Slack and email but we also use WhatsApp to celebrate wins, laugh at funny conversations and just share random bits of life together. We’ve accumulated some good chat conversations over the past two years. Here’s a small sample. That time when our CEO, Oron, decided to participate in Iron Man. 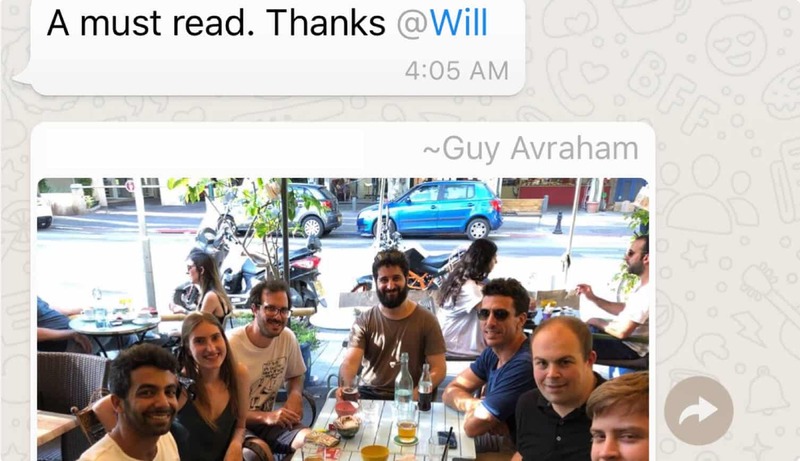 The Tel Aviv team partaking in their their weekly happy hour. When J.P., our VP of Operations, visited Tel Aviv for the first time.